Marmot minutes: Attack of the clones! As I've discussed in previous blog posts, I am working in the lab to characterize major histocompatability complex(MHC) genes in yellow-bellied marmots. These genes code for molecules that recognize and bind proteins floating around in and around our cells. The MHC complex distinguishes between self and non-self proteins, and initiates an immune response when a non-self protein (e.g. pathogen) is detected. MHC proteins must therefore be able to accurately differentiate a wide array of molecules and pathogens specific to the population of interest. These genes are therefore the targets of enormous selective pressure (making them a great model for evolutionary genetics studies) with numerous, ecologically important consequences. An individual's MHC geneotype may determine how it chooses mates, how it responds to parasites, and even how long it lives. AGA?T? where ? is T and A...becomes a bit more complicated, right? There are more than two possible alleles in this case, so was mom AGATTT and dad AGAATA? Or was mom AGATTA and dad AGAATT? Now imagine that you are working with sequences that are hundreds of base pairs long with 10-20 variable positions. How could you possibly figure out the alleles present in an entire population of marmots? 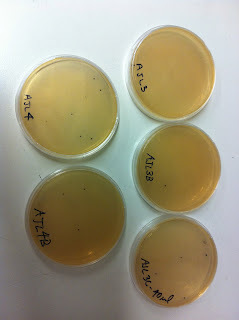 Conveniently, the bacteria we use are designed with the PCR product insertion site in a gene that causes them to produce a blue color. 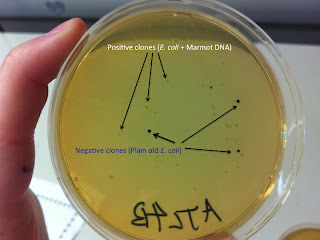 Therefore, colonies that have accepted the insert (and are now part E. coli part marmot) turn white, while colonies that have not accepted the insert retain their blue color (see below). This makes the clone screening process much more efficient, though it is still a time consuming and labor intensive process. And in the end, if all goes according to plan, I am left with sequences of individual alleles that can be used in analyses, as well as lots and lots of marmoty bacteria.